Description: A stunning Mission styled pendant inspired by the Arts & Crafts movement. A luxurious Beige art glass shade is trimmed with Root Beer glass and inverted for beautiful ambient uplighting. 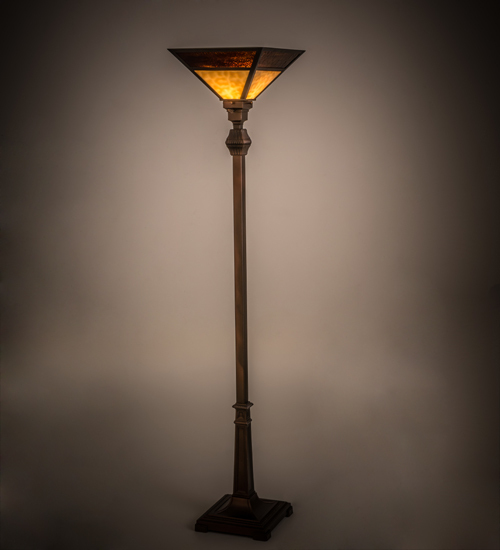 The shade is complemented with a Solid Brass frame and a decorative floor base featured in a warm Mahogany Bronze finish. The lamp is the perfect illuminating accent for nearly any room. The lamp is available in custom colors, styles and sizes available. Energy efficient lamping options are offered. Handmade in the USA! UL and cUL listed for dry locations.